Strikers Andy Brown and Akwasi Asante are the latest recruits joining Solihull Moors for next season's campaign. Strikers Andy Brown and Akwasi Asante are the latest recruits for next season’s campaign, joining the Moors from Nuneaton Town and Kidderminster Harriers respectively. With the impending departure of Omar Bogle into the Football League, the duo will link up with Stefan Moore as the club’s centre-forward options for manager Marcus Bignot. 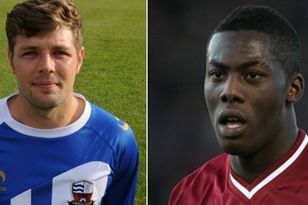 Twenty-nine-year-old Brown is a proven non-league goalscorer, leading the line for his former clubs Nuneaton Town and AFC Telford United over the past seven seasons. His four years at Telford included helping them achieve promotion to the Conference Premier in 2011 through the play-offs. Following a move to Nuneaton Town midway through the following year, he achieved his second successive promotion from the Conference North. Scorer of 44 goals for Nuneaton, his ability will be pivotal to Solihull Moors’ forthcoming campaign. Dutch-born Asante moved to the UK when he was just 13 years old. He then came through the academy at Birmingham City making his debut for the club in a Europa League play-off game against Portuguese side National in 2011. He had loan spells at Northampton Town (where he made his Football League debut) and also Shrewsbury Town. Although considered an exciting prospect, an injury-hit time at St Andrew’s led to the 22-year-old being released last summer. He joined Kidderminster in December 2014 where he made 11 appearances and scored 11 goals. Brown joins former Nuneaton team-mates Theo Streete and Gavin Cowen at Moors while Asante will link up again with ex-Harriers colleagues Danny Lewis and Callum Gittings. Theo Streete has rejoined Solihull Moors from Nuneaton Town.